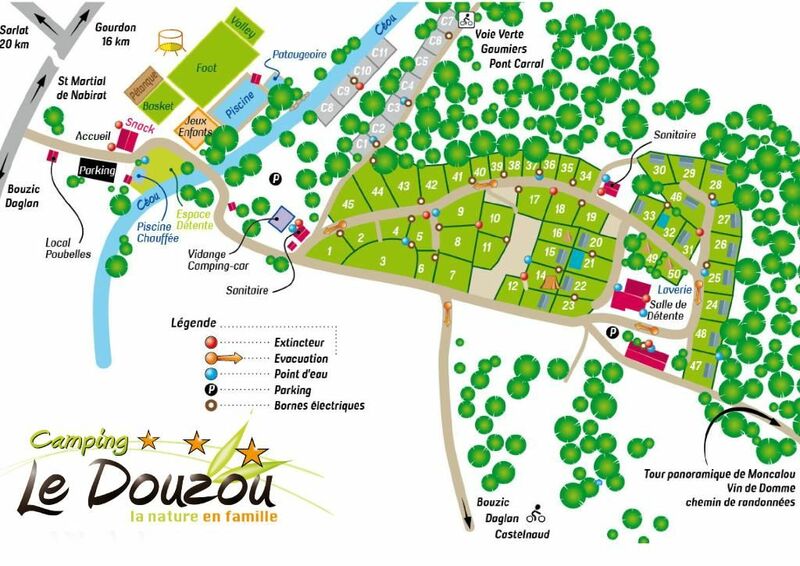 The campsite “le douzou” accepts the principle of rental (location / rental). Once you book, the campsite guarantees you the rental of a site or a rental for the day of your arrival. This reservation is subject to certain terms and conditions. Any change that may result in a change in the amount of the fee in addition or less will have to be reported before your arrival. In case of incorrect declaration of the tenant, the contract can be terminated and the sums paid will remain at the campsite. The rental is personal. It is forbidden to sublet or assign the site to a third party. You must notify the campsite of any delay in your arrival, in order to keep your reservation. The manager reserves the right to dispose of the site or the lease after 8 hours. The sums paid will remain vested in the campsite. When the stay is started, there is no refund possible due to early departure for whatever reason. The acceptance of the rent commits the tenant to respect the rules of the campsite. You must inform the reception of the arrival of visitors. They will be required to pay a fee to the campsite. They must leave their vehicle in the outdoor car park. The rental is payable at the rate of 25% as a deposit upon the signature of the contract and the balance 4 weeks before the beginning of the stay. A deposit of 300 euros will be paid on arrival and returned on the day of your departure minus any missing or damaged. The rentals are from Saturday 4 pm to Saturday 10 am or from Sunday 4 pm to Sunday 10 am and includes water, gas and electricity. Cleaning is the responsibility of the tenant. At the end of the stay, the rental must be returned in perfect condition of cleanliness. The end of stay cleaning option is possible at the rate of 60 euros. Bed linen and towels are not provided. Cleanliness protection will be provided. For the mobile homes Bermuda and ibiza, the adult beds are 160, and for the other MH in 140. The rental of the site will be effective after payment of the deposit of 25% from the signing of the contract or its reservation online on our site. The balance of the stay will be payable on arrival in bank card, ancv and cash. The taking of possession of the site is from 12:00 to 12:00. In case of non-prior reservation, the tenant must inform the manager of his end date and pay. From 1 July to 30 August 8h30 / 12h00 and 14h / 18h. From 1 April to 30 June and from 1 to 30 September 9 am / 11.45 am and 2 pm / 6 pm at the top of the campsite. Snack open from July 1st to August 30th 11h30 / 22h. You will find at the reception desk all information about the services offered by the campsite, the tourist attractions of the surroundings and various addresses that may prove useful. Anyone arriving at the campsite must go to the reception to fill out the accommodation papers. The balance of the stay must be paid on arrival. Arrivals are from 4 pm and departures before 10 am. Barbecues (except gas) are not allowed on the pitches, there is a barbecue area next to the games room. Visitors must register at the reception and pay a daily fee of € 3 per person. The swimming pool is forbidden to them. Hire of sheets, bed and baby chair, refrigerator in the reception. Every day, bread in the campsite. You have to order it the night before before 8 pm on the billboard or in the activity room (except July). It will be available the following morning from 8:30 am to the reception. On this occasion a coffee will be offered to you. We are on a rugged natural site and riverside. Children are therefore permanently under the responsibility of their parents. Fire extinguishers are available to all. A first aid kit is available at the reception desk. The management is not responsible for valuables or cash left in tents, caravans or rentals. A safe is available at the front desk. Campers must respect the cleanliness of the sanitary facilities as well as the other premises. The games room is open from 10:00 to 18:00. If you want to watch a DVD, contact the reception. Children must not be alone in the playroom, they must be accompanied by an adult. Garbage will be sorted into a single collection point. Sorting bags are available at the reception desk. The garbage cans (glasses, plastics, household waste) are located at the entrance of the campsite. Please close your bags. The swimming pool is open from 10:00 to 20:00. Children must remain under the supervision of their parents. Inflatable toys are prohibited except the armbands for the smallest. The snack is open from 1 July to 30 August from 11:00 to 22:00 and offers ice creams, pizzas, sausage fries and fresh drinks. No pizza lunch and evenings on Tuesdays and Thursdays. For theme meals, you must register the day before on the notice board. Outside July, a bar area with drinks, ice cream and small grocery is available in the activity room. 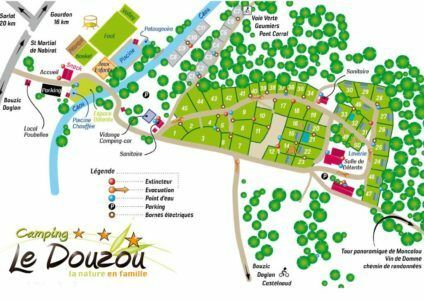 Camping “le Douzou” reserves the right to use the pictures taken during the activities or evenings. These images can be exploited in a commercial context.